While AllClear coatings dramatically reduce the cleaning requirements of treated surfaces, just like high quality Teflon-coated cooking pans, some cleaning and maintenance is required to ensure on-going performance. Following the maintenance tips below and utilising the described maintenance accessories will ensure many years of satisfaction. 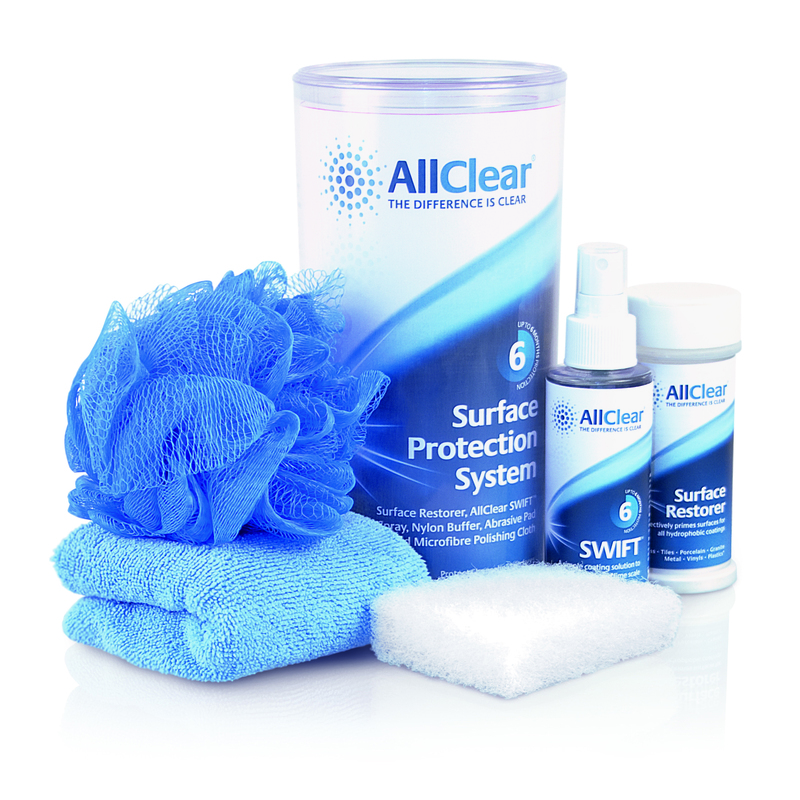 For your convenience, AllClear Coatings has created a Surface Protection System – an all-in-one kit that includes everything you need to maintain optimum surface performance. Please contact us for the specific maintenance recommendations relating to your application. Once treated with AllClear, will I still need to clean the surface? The AllClear coating reduces cleaning time but it does not eliminate it entirely. AllClear is similar to the development of non-stick cooking pans. While you can cook food in uncoated pans, it is so much easier to clean if you cook with non-stick pans. While you still must maintain your AllClear coated surface, the time and effort required are significantly reduced. What care and maintenance does AllClear require? Maintenance and care vary substantially according to the type of application (treated surface type and location/exposure) and the abrasion which the treated material is exposed to. Abrasion means any mechanical (such as windshield wiper on an automobile) or non-mechanical force (such as wind or dust) affecting the treated product. Thus, an exterior architectural glass structure exposed to all kinds of weather conditions will require much different maintenance and care than an interior kitchen granite countertop, a porcelain sink, lavatory or a ceramic tile bathroom wall. While AllClear® does make treated surfaces water and oil repellent, stain and scratch resistant, among other properties, and lasts for a long period of time (years in most cases), maintenance time is guaranteed to be reduced, depending on the application, by as much as 50% and up to 90%. AllClear eliminates the need for any harsh, expensive and toxic chemical cleaning sprays. Rinse or spray the surface with clean water. Let water drain off and wipe dry. Use AllClear Surface Restorer on any ‘sticky’ or visibly stained places that cannot be removed with a nylon buffer. Then apply AllClear SWIFT Spray, rubbing it on with a soft cloth, and polish it off with a microfibre polishing cloth. Even if you haven’t followed the regular maintenance tips above you can still restore your surfaces to maximum effect. Begin by using AllClear Surface Restorer powder to remove hard water marks and residue. For tough stains use an abrasive pad which won’t scratch the surface. Once the surface is clean, apply AllClear SWIFT spray with a soft cloth and polish it off with a microfibre polishing cloth. Your surface is fully restored to full repellency. Never use harsh cleaners or chemicals on your AllClear treated surfaces as it may damage the coating and the underlying surface.